Plastic Recycling Industries, run by Coca-Cola Beverages Africa (CCBA) Uganda in Nakawa, Kampala, has signed a Memorandum of Understanding with a Plastics Collection Centre in Masaka to cover Western Uganda. The PRI Factory has processed more than 2,000 tonnes of plastic waste so far this year alone. Signing on behalf of the Masaka Collection Centre, Director Andrew Bownds, pledged that the Centre would collect fifteen (15) tonnes of plastic waste a month for the first six months, and would increase collection to twenty (20) tonnes of plastic waste a month thereafter, with a future target of 50 tonnes. 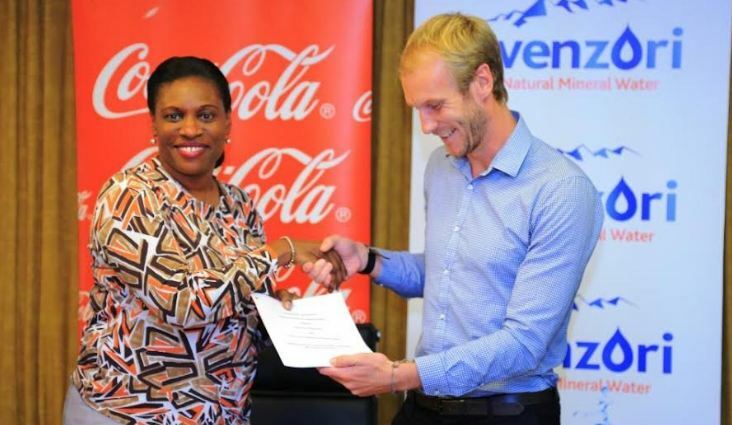 “We are happy with the partnership we have with Coca-Cola Beverages Africa. In Masaka, we are operating the Collection Centre in partnership with the Masaka Diocese, who have provided the land, and we are grateful to Father James Sendege for the support,” he said. Norah Odwesso, CCBA Group Public Affairs and Communications Executive Director with Masaka Collection Centre, Director Andrew Bownds after signing the MoU. He thanked Coca-Cola Beverages Africa for enabling the Masaka Collection Centre to create 50 direct jobs. “We are happy that this project has provided employment to youth and women in Masaka, and to the disabled. We work with the Masaka Disability Union who on their own deliver up to eight (8) tonnes a month to the Masaka Collection Centre using their network mobile collection points,” he said. Norah Odwesso, Group Public Affairs and Communications Executive Director for Coca-Cola Beverages Africa (CCBA), said the Group was excited with the progress Uganda has made with recycling and environmental conservation through the collection and recycling of plastic waste. Recycling Industries as a global shining example,” she said. Odwesso also thanked the Kampala Capital City Authority (KCCA) which is in partnership with Coca-Cola Beverages Africa in running collection centres in Kampala. Simon Kaheru, Public Affairs and Communications Director at CCBA Uganda, welcomed the Partnership with the Masaka Collection Centre and encouraged more partners in other parts of Uganda to join in collecting and recycling plastic waste. “We all have a responsibility to conserve our environment by getting rid of plastic waste. Coca-Cola Beverages Africa is taking leadership through Plastic Recycling Industries but we must work through partnerships such as the one with Masaka Collection Centre, and more. The Recycling sector provides income for youth and women in Kampala, and now in Masaka and western Uganda, but we would like to see more of these initiatives so that we take more plastic waste out of the environment and turn it into valuable items and incomes for Ugandans,” he said. PRI buys the plastic waste and recycles it into flake for export to foreign markets that included China and India.